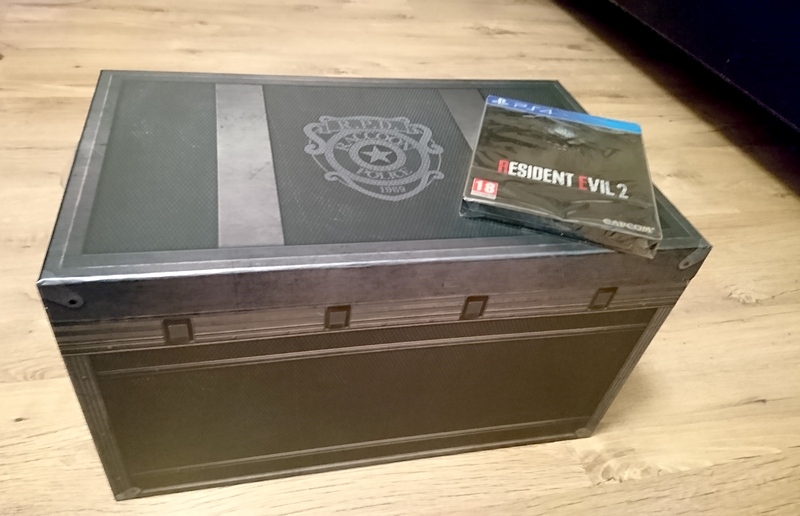 As I was handed over my Resident Evil 2 Collector’s Edition from Gamestop I was stunned how big the package was. Literally it didn’t fit in the biggest sack they got. Thankfully I got my slave servant with me so I didn’t have to carry anything at all. 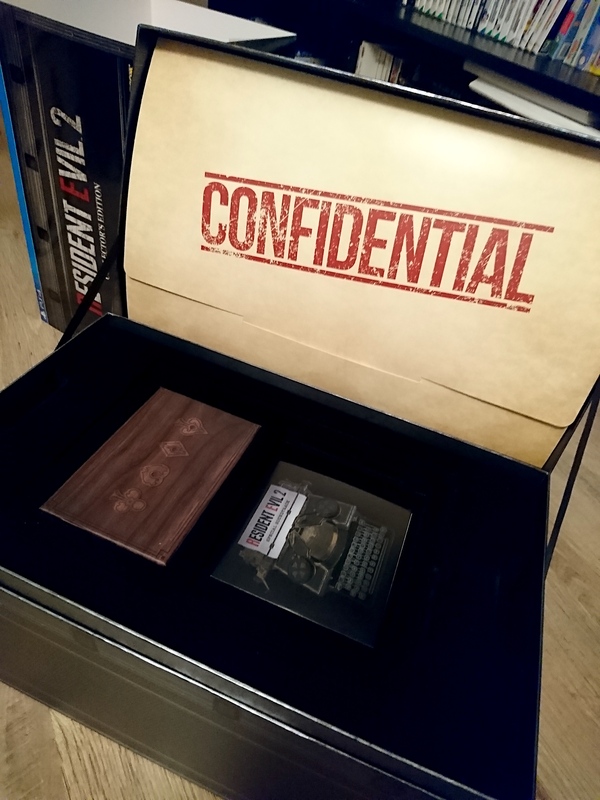 I didn’t look up what the Collector’s Edition includes since I wanted to be surprised what’ll it contain. A little late Christmas morning for me. The package looks like a chest or an inventory box from the Resident Evil games. It felt sturdy enough to actually carry some heavy stuff and not just being all visual. All this was covered with protective cover. I couldn’t wait to open this up. First thing that popped up was a CONFIDENTIAL file attached inside of the lid. 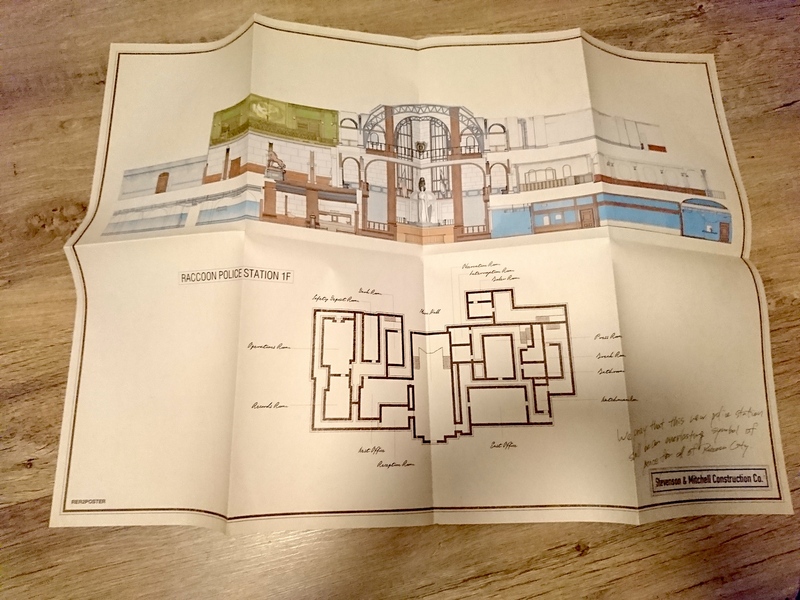 I made sure no one was around as I peeked what it had and I found a map/construction paper of convertion a museum to Raccoon City Police Department, and a small paper that had a code to downloadable bonus material for the game. I put them back in the file and saw a writing in the box: “Written authorization required to read this file. WARNING!” They left section for me to fill and sign, so I did that to be legally able to read the file: It included a booklet of brief information of the characters and places. 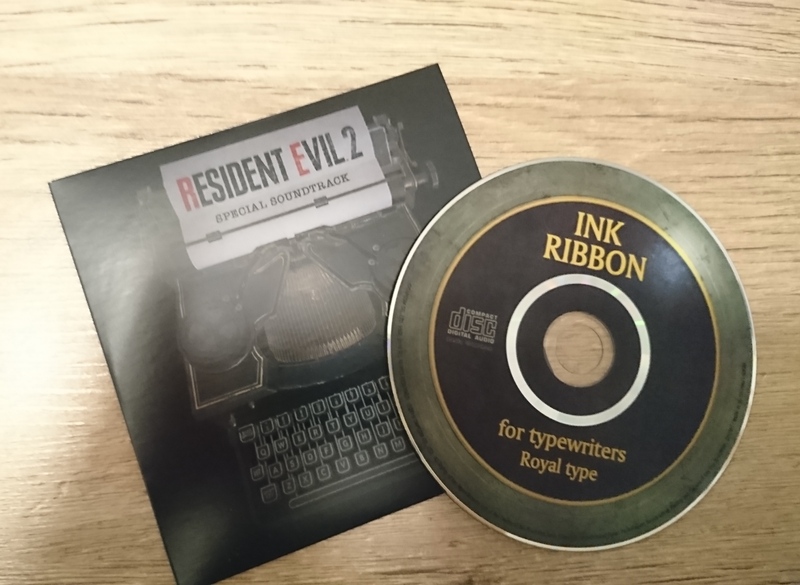 Under the booklet was a small box, a pin, a CD of the original Resident Evil 2 music and the Resident Evil 2 game for PS4 in a special steel case. The pin had a picture of Claire’s famous jacket and the text ‘Made In Heaven’. 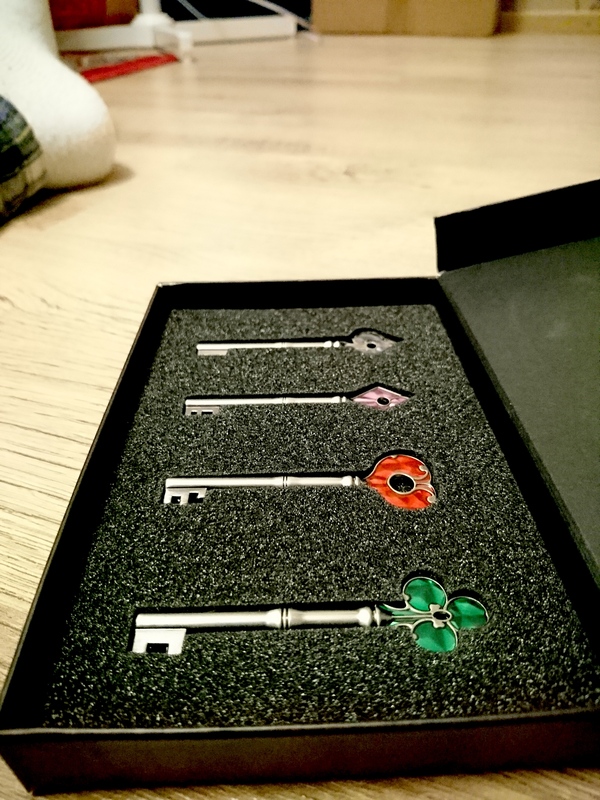 The small box included four original keys to the R.P.D. doors. Now I can access those closed places, finally. 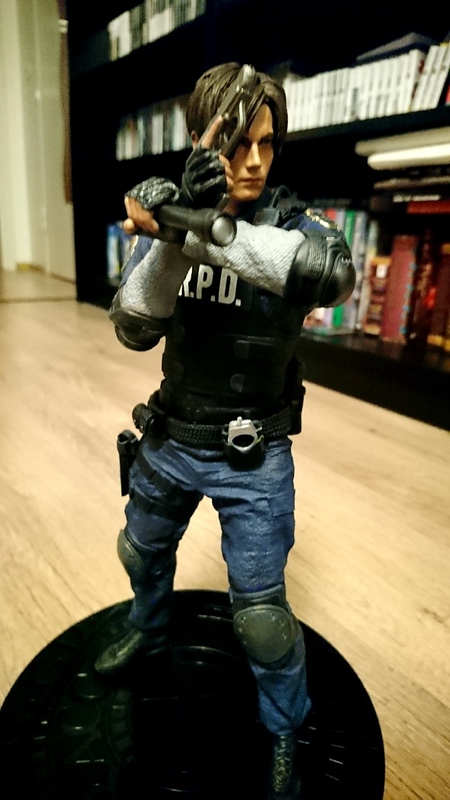 Taking everything out of the way revealed me a statue of Leon S. Kennedy with a seperate gun and flaslight, and of course, the round stand. I’m very keen of details and if something is off, I’m off. Especially if it’s something I like very much, such as Resident Evil series. First thing I noticed was the keys. I was so sure they were made of plastic, but no! They’re made of metal and the upper part with playing card signs were made of plastic that looks like glass. I think it’s nice touch of the detail. The CD containing the original soundtrack would’ve benefit if it also had the remade version. The pin is cute, nothing special about it other than I think I’m going to wear rather than keeping it on the shelf. The original game being from 1998 and very low resolution and graphical quality, so from a pixel mush it’s difficult to make “the absolute original one” unless you want them to make low jpg image quality that look like some cheap Chinese nock-off. So, these keys and pin are not 100% original/accurate, more of the versions that the new game contains, but absolutely true to the original ones and I don’t see anything changed ideal-wise. The keys being made of metal and sturdy enough to actually open a real life door there’s nothing more to it—I want talk about the printed stuff. The map was printed on a thicker paper than normal paper and it was all matte. The base colour was yellow-ish that made it look old, tanned paper. It works and makes it look much better than printed in thin, white and glossy paper. The booklet, though, was also made look like older paper and the pages were thick, but the colour of the pictures were too dark. It was hard to see what was going on in them. 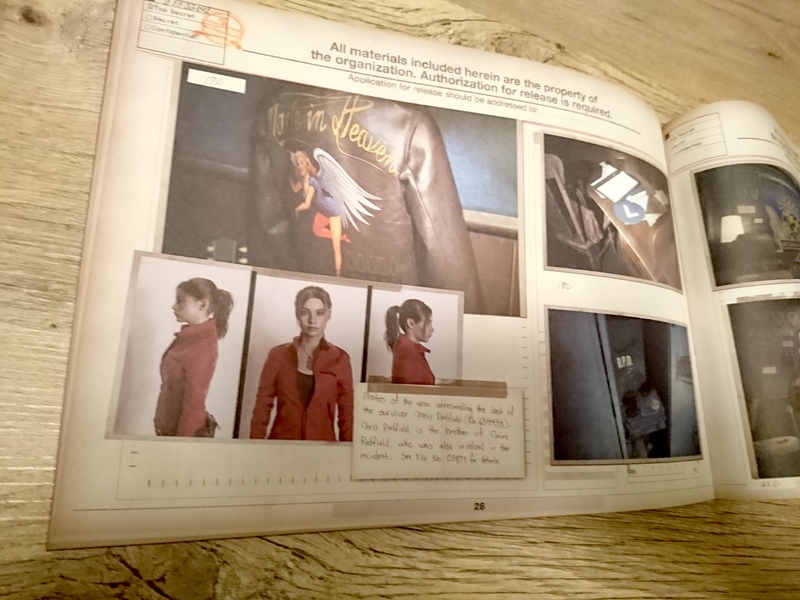 This might be due the game being very dark and gloomy and them taking photos in the game and seemingly not brighten anything when making the booklet. Also, what bothered me was the unsharpness they had all over. As a writer with degree of printing products I can say this should’ve been much better than it is. 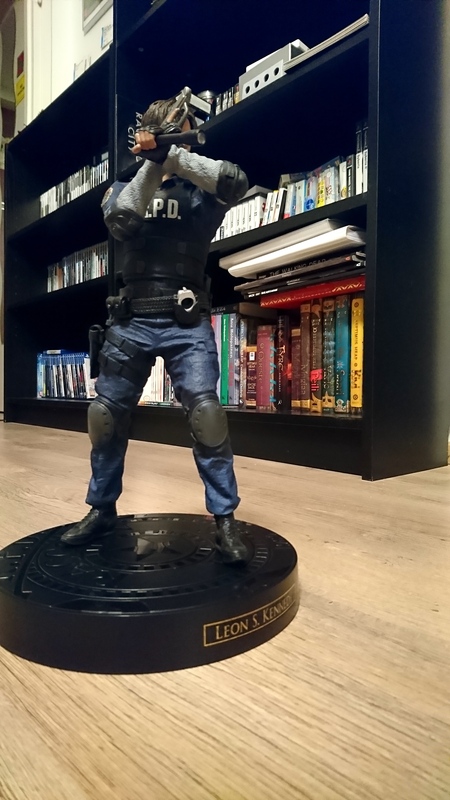 Then we come to the star of the box Leon S. Kennedy statue. First thing that was noticeable was the weight. It was pretty heavy and not some cheap hollow statue. It had weight and sturdyness in it. It was made of plastic, but I’m sure there was something heavier used in the base/inside of it. Because I’m so shallow I’m only gonna review the outside of it. The plastic, was little bit soft and moveable like in the hands where I had to stick the gun in. The flashlight was easy to push in, but the gun, ugh. I was sure I was going to break it as the gun wouldn’t go in his hand, because his fingers was not giving up. It was struggle, but I finally got it. The statue got few holes in the shoes where to stick the base. It didn’t fit perfectly, but the little elasticity gave mercy. The base: it was cheap, light and horrible looking. It was hollow piece of plastic with embed pattern. The nameplate was OK and not just some ill-placed sticker. Now we come to the paint and details of the statue. It’s very detailed, with clothes having different textures, shadows and colours. Paint looks high quality and I love the different shades on the clothes and not just being painted fully with colour. The details in the eyes are beautiful. The statue was the only thing that was painted, and I would say, by hand. I don’t know about the proportions since I’ve never seen Leon in real life, but the statue is approx. 29 cm tall which is approx. 11,5 inches. According the internet Leon (and many other Resident Evil character) have grew taller over the years, Leon being 178 cm, 5’10 and then getting taller as getting older now being 180 cm, 5’11. I made measurements and astronomical calculations and I used me as a model as I’m 180 cm tall and the results tell that this statue is very accurate. It’s actually EXACTLY correct. The issue where I live is the prices. We have very high taxes so it might be the cause of many things costing more than it would in other countries. The ration of the prices are always like this: if Playstation 2 Classics comes with price of 99$ it’s 129€ (145$) to 179€ (205$). Or if some price is 399$ it’s absolutely never converted to the real price of 350€. It’s automatically 399€ (450$) at MINIMUM. 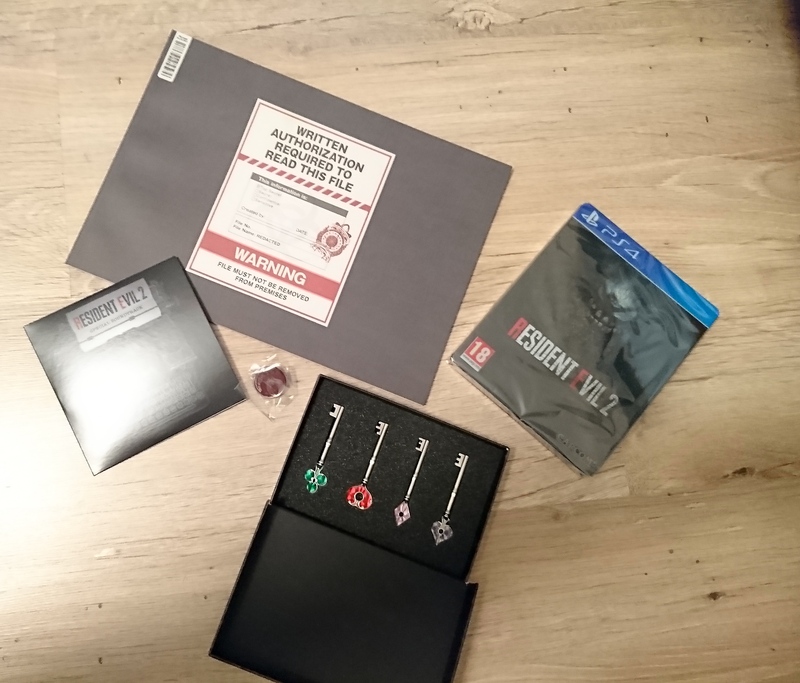 So the Resident Evil 2 Collector’s Edition was 199$ in the world and I payed 280€ (320$) of this. Would you pay 320$ for something that includes so little? So yeah, I demand some quality. The prices are going higher every year and it will come to a point when they don’t sell anymore. I was thinking that this still was lacking of something until I realized; it didn’t contain any biohazard stuff. I was expecting to see Umbrella logos and biohazard signs and T-Virus tubes… all that, but this is very settled and contains things that could be found in the R.P.D. building. I really don’t know if I should say yes or no to this because it’s both. So I say this: Yes in U.S. — No in Europe. 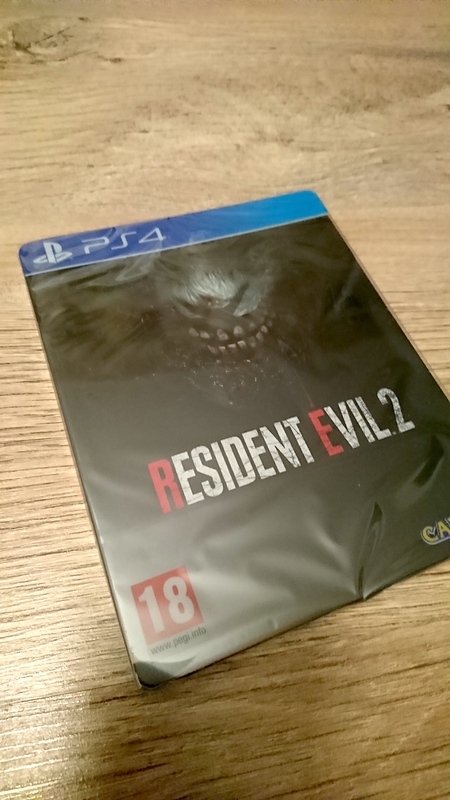 Resident Evil 2 (PS4 Pro) review coming soon.